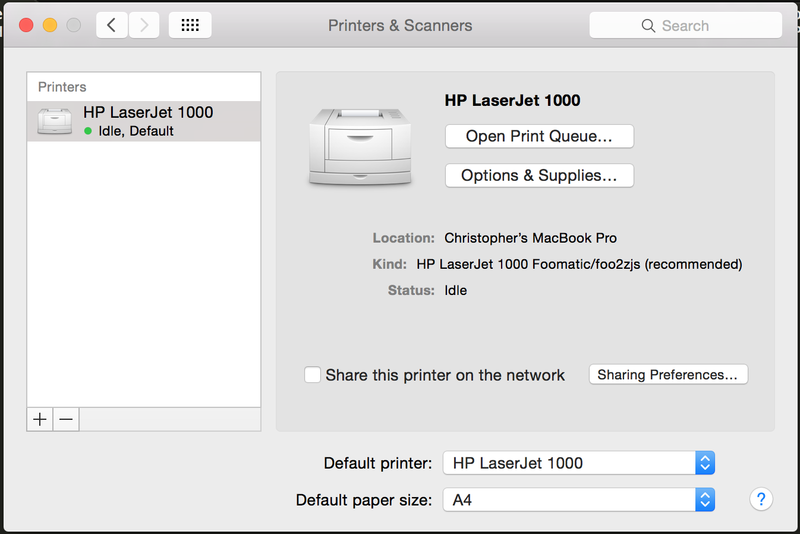 This post will explain how I managed to install my 13-year-old HP LaserJet 1000 series printer on my MacBook Pro running OS X Yosemite version 10.10.2. I feel like I'm on familiar territory here with HP's lack of legacy support for peripherals such as scanners and printers. See my popular post on How to install an HP ScanJet 2200c scanner on Windows Vista. I still have the same printer and scanner and I'm determined to make them work. And stick it to the man. Even though my dad works for HP. Especially because my dad works for HP. I am hugely indebted to donthomaso's post on the HP Support Forum thread download driver on mac 10.7.4 for HP Laserjet 1000, which linked to this set of instructions by The Daily Chu / chuck: HP Laserjet 1000/1005/1018/1020 on OS X Lion/Mountain Lion/Mavericks. Although I didn't use them, these instructions for HP Laserjet 1000 on Mavericks also look pretty good and are a bit shorter than mine. The main purpose of this post is not to take any credit but to make it easier for other users like me to find instructions that will work for them. 1) Install XCode from the App Store. 2) Open Terminal (by typing cmd + space and typing Terminal and pressing return - the first few letters are usually enough). Type xcode-select --install in the Terminal window to install the required command line developer tools. 3) Install MacPorts by installing the package file for OS X 10.10 Yosemite. Packages for other versions of OS X are available on the MacPorts installation page. 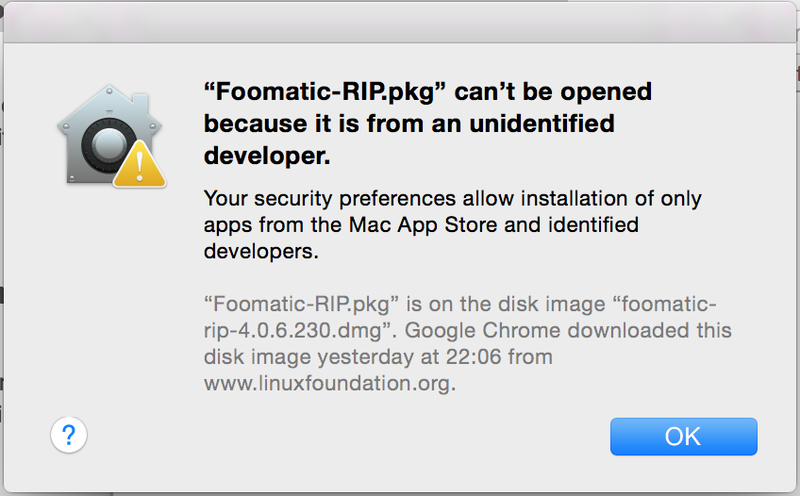 6) Install Foomatic-RIP. I used version 4.0.6 for for Mac OS X 10.3.x (Panther) - Mac OS X 10.9.x (Mavericks). At this point you may encounter a security warning message if your security preferences prevent you from installing apps from unidentified developers. To fix this, open your Security & Privacy settings in System Preferences (by typing cmd + space and typing Security & Privacy and pressing return). Click the lock icon to make changes. Type your Mac password if prompted. Click the radio button to allow apps to be downloaded from Anywhere. Leave this open for now because you will need it to allow other apps to be installed during this process. However, I recommend resetting it to Mac App Store and identified developers and re-closing the lock icon when you're finished to keep your Mac more secure. I downloaded foo2zjs in my Chrome web browser from http://foo2zjs.rkkda.com/foo2zjs.tar.gz (which by default put it in my Downloads folder). I opened the zip file there by double clicking on it. I then typed cd in Terminal, added a space, and dragged the unzipped foo2zjs directory into the Terminal window to save me typing out the full path i.e. /Users/christopherwhalen/Downloads/foo2zjs where christopherwhalen is my Mac's Home directory. Yours will be different, unless you're also called Christopher Whalen (in which case, hi!). If you did it this way, you should now be in the foo2zjs directory, so skip to step 8.5 below. sudo make cups (to restart the spooler if you use CUPS - nope, I have no idea what that does either, but I did it anyway, even though it appears to be optional). 9) Add the printer via Printers & Scanners in System Preferences (type cmd + space and start typing Printers & Scanners), but do not close Terminal just yet. 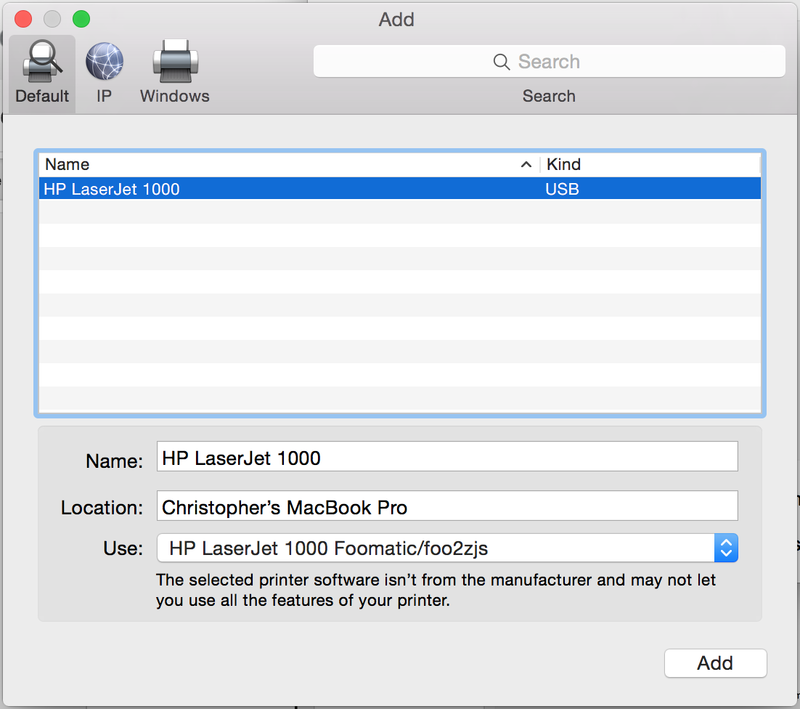 Click on the + then choose HP LaserJet 1000 and it should automatically load the HP Laserjet 1000 Footmatic/foo2zjs in the Use field. Click on Add to add the printer. I think after that, my printer worked. Good ole chuck also suggests you run sudo lp -oraw /usr/share/foo2zjs/firmware/sihp1000.dl in Terminal to upload the firmware to the printer. 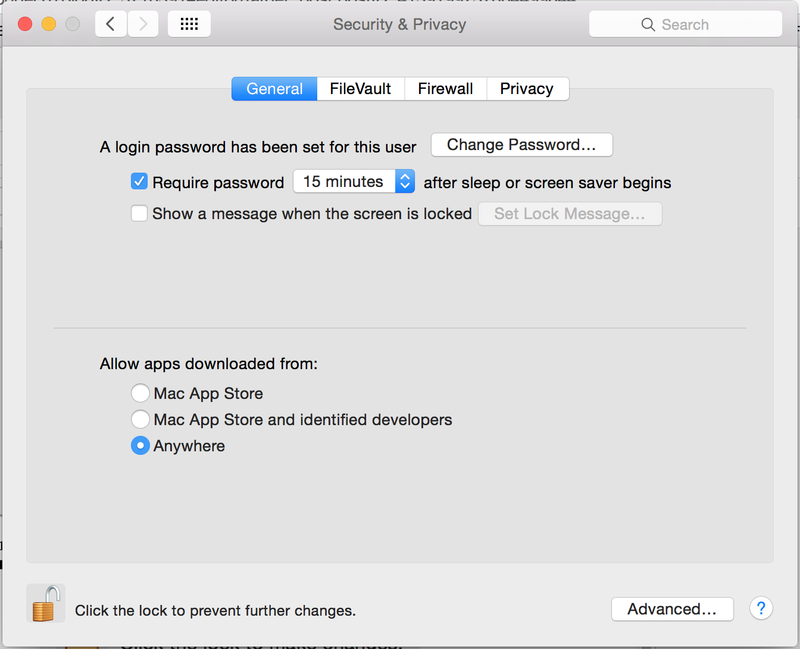 10) Finally, reset your app download security settings to Mac App Store and identified developers and re-closing the lock icon as described at the end of step 6 above. Give me a shout in the comments if this did or didn't work for you. It was a kinda long and complicated process. I made some mistakes along the way, but I eventually got there. Please let me know if you think I've missed anything in the instructions above or if anything is not clear. Update on 24 March 2015: I found that when trying to use the printer a second time, it didn't work. I repeated some of the steps of the installation process, but I think the important part is running sudo make cups (step 8.9 above) to restart the spooler. Update on 1 June 2017: Repeat steps 8.4 to 8.9 to get the printer to work again if you've already installed it. Thanks Chris ... that works for me after I was planning to throw out my old loved printer into the garbage. Please keep posting you tips for us. Hey. Thanks for your comment. Glad it worked for you! Another printer saved. Thank you very much for tips. Everything is ok except that the letters are not strongly . it seems like to be red colour and i print in black . My HP LaserJet 1000 series is a monochrome printer. If yours is printing red, is there something wrong with your toner cartridge or are you using a different printer? what I meant in my previous message is that although everything look ok and my HP LaserJet can print all document, all letters are faint black (as if I would tell it to print red letters)!!! This sounds like more of a hardware than a software problem. Have you tried using a fresh ink cartridge? It sounds like you might be running low. If the printer is powered off, the sihplOOO.dl file needs to be sent again. I think that the sudo make install-hotplug is supposed to make that happen...but I'm not 100% sure. Thanks, Anonymous! I'll try that next time. Thank you for this, I have tried to do this before but never succeed, I no longer need to open as PDF in preview, save to dropbox, go to my Windows XP laptop and print from there. Thank you for making my day excellent. You're welcome. Thanks for the update. I hadn't noticed that mistyping of O for 0. I've made that change to step 9. I've followed your instructions line by line above, but after part 8.3, I seem to get an error message in the terminal. Is there any other way to install the foo2zjs? Sorry, I don't know how to fix that. I'm in trouble with the same error occurred in the task "make", have you found a solution to fix it ? I would be grateful to you to inform me, thank you for your reply. You’ll get several folders which can be used as source. So, to summarize, after the stdio.h was copied to /usr/include , running "make" returned no error in my case, so I could run all other subsequent steps. I can gratefully confirm that this post is still valid for 10.14 Mojave OSX. Thanks again Cristopher, without you all our hp 1000 printers would be in the garbage by now. W00t! Thanks so much for your detailed instructions, Roman. I’m delighted every time this post helps someone bring their printer back from the dead. I did all the steps, all worked fine, the problem in the Add window, the name of the Printer won't appear!!! why? The most obvious question is: is your printer plugged in at the wall and connected to your Mac by USB? I really appreciate you taking the time to write this. I followed all the steps to the letter. Even though I managed to install the printer through the OS X printers panel, all I get is a flashing orange light that won't stop. Any clues into this? Nope. Not sure what that's about. Sorry. Is the flashing orange light on the printer or in OS X? When I tried to print anything, I saw the file display in the Print Queue for a split-second, then nothing. I also noticed the Yellow light on the printer was blinking non-stop which means there's a paper-jam, an open compartment or the toner cartridge is not seeded properly; so I opened and closed everything, re-seeded the toner cartridge, then unplugged the printer for 2 seconds, plugged it back in, and it worked! Amazing! I was tired to search and try how to install my HP LaserJet 1000 printer on OS lion, and I finally did it! I use Xcode Version 7.1 (7B91b) and OS X El Capitan Version 10.11.1 (15B42) . I cannot print with my hp . Are there any changes in your instructions ? Hi. I haven't tested it on El Capitan yet, so I don't know if you need to do anything differently. Is it possible to solve the problem on ElCapiten with this ? Christopher, you are my hero! Thank you so much! You saved hours of my life and hundreds of nerve cells. You're very welcome, Olia! I'm glad it worked for you! What happened ? Is Ghostscript 8.71 not compatible with OS X 10.11 ? Does anyone has a tip ? Hi Claude. I'm not sure. Sorry. I'm not able to help diagnose problems with the process. I just shared what worked for me at the time on an older version of OS X. Thank you to take time to answer me. I will continue research on Ghostscript and if I find something new, I will make a comment on the blog. I am going through this protocol, and I am having the same issue: the installation of Ghostscript is failing... Have you found a solution? I am using macOS Sierra. I am having the same issue with Ghostscript. It won't install on macSierra... Have you found a solution? make: *** [all-test] Error. Is there any assistance that you can offer? No, sorry. I can't help with that. Xcode can't be installed on "Macintosh HD" because Mac OS X version 10.10.5 or later is required. You should be able to get older versions of Xcode at Apple Developer. Thank you. I successfully got the Xcode version I needed from Apple Developer. I am now struck trying to get foo2zjs to unpack using Terminal. Do I need to get 'wget' before using Terminal? I unzipped foo2zjs outside of Terminal but have not been able to get the driver to appear as "use" in Printers and Scans. It is greyed out so I know I need to use Terminal but when I am in the foo2zjs directory, Terminal reports the command 'make' (without ') is not found. Any suggestions? Do I need 'wget' to use Terminal for this? Ok. I figured out I needed XCode Command Line Tools in addition to Xcode itself. I also got Mac Ports working. I followed all your sudo commands for terminal. Everything appeared to load correctly including installing the driver. I selected the printer as suggested and the default "use" driver. Everything appeared as if it was working. However nothing was printed. Not .pdf files or TextEdit files. The printer dialogue box identifies the HP Laserjet 1000 and states "Printer Ready" data appears to be being writing to the print spooler but no printing is occurring! I got the Laserjet 1000 to print on this old Mac Pro. 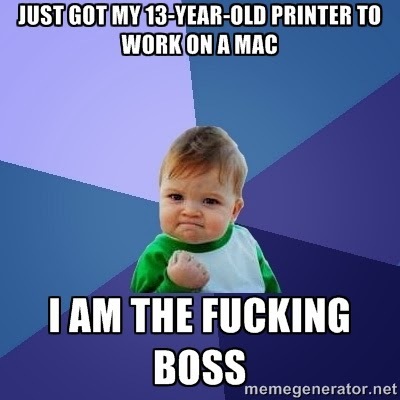 Just had to completely power down and restart making sure the printer was online. Thanks a lot not I can finally dump Microsoft! Hi Kim. I'm glad you figured it out for yourself and I'm delighted you've got your printer working! Just to let you know, I just repeated this process on my Macbook (Early 2008) and the printer worked. Thanks again for all your support. Did you ever get a fix for this? I am getting the same error. I will quote what user "Matt" wrote below on 23rd of July 2016, it applies in this case too for High Sierra :"all you have to do is make sure the Rootless System Integrity Protection is disabled and the instructions work fine for El Capitan users. To do this, restart your Mac in Recovery Mode (Restart while holding Command + 'R'), go to Utility > Terminal. In terminal type csrutil disable and hit return. Then restart. ". It worked in my case, I had the same error on step 8.7 : sudo make install in foo2 directory. Hope it solved your problem too. Cheers ! Thanks Matt, Thanks Christopher for this post ! Chris, THANK YOU! 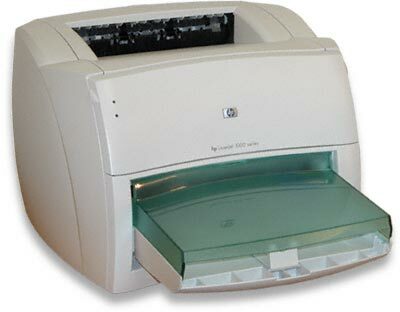 Our office is tight on cash, but I needed a printer - found one in storage, the old HP Laserjet 1000 (3 of 'em, in fact - nobody else has found Windows or Mac drivers to continue using these things). I used your guide yesterday, and over the course of a few hours, had everything installed. I could see the printer over USB, I could select the foo2zjs driver, etc... but I just could not print. I would get either a "Printer not connected" or "Unable to send data to the printer" error. I gave up, shut down my iMac (OS X 10.9.5) and went home, determined to give it another go in the morning. SO this morning the same problem arose upon booting up the Mac. I had done the firmware upgrade to the printer yesterday that was recommended (though I think it gave me an error upon executing the terminal command), fyi. I found someone in Apple Discussions who had discovered a link to HP Printer Drivers 3.1 (https://support.apple.com/kb/DL907?viewlocale=en_US&locale=en_US) and was in the process of downloading them (link here case it helps somone else, since this all appears to be voodoo anyway). I had the bright idea to power cycle the printer (which involves yanking the power cord, as there is no power button on this thing). Would you believe - that was the problem? I am now printing, without having installed the HP 3.1 drivers (though I'm keeping them around just in case for the future). Dude. You rock. Thanks SO much! Thanks very much for your detailed comment. I'm pleased you managed to get your printers to work. No, thank you, Matt! Thanks for figuring out how to get it working on El Capitan and sharing it. I'm on Sierra. I'm getting an Error 71 when doing the sudo make install. Don't you ? Thank you so much Crhistopher Whalen, two years ago with your tips I could give a new life to my sisters old HP at home with my MacBook, thank you Dawid Baraniak, it still works with macOs High Sierra. Thanks for your time and efforts!! It works perfectly! !